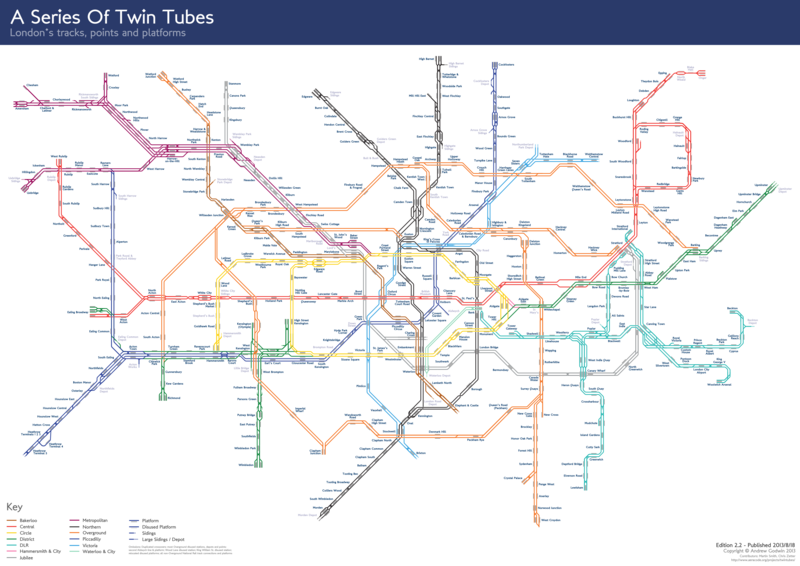 A map of the London Underground, Overground and DLR, in a similar style to the iconic Tube map, but with the individual tracks, platforms and points all marked. The map (as of version 2) now includes depots, disused stations, sidings, and most other unseen details about the network (with the exception of the Overground, as it's part of the National Rail network and far too complex to fit on one diagram). It's not geographically accurate, though it is generally more accurate than the standard tube map - for example, we keep South Tottenham to the south of Tottenham Hale, and curve the eastern ends of the DLR backwards. The map is created with an automated tool which takes a textual description of the lines and platforms (as a series of points), and which then automatically draws the lines, station names and labels, saving the tedious process of moving lots of lines around and ensuring all the angles and curves match. Placement of the stations and waypoints is done with a custom GUI tool which draws the map in real time, as we found that it took too long to edit coordinates in the text file, create the image, and then look for problems. For more detail, see my blog post about the project. If you notice an error or omission, please contact me, and I'll include a fix in the next version of the map. Code is available on GitHub - pull requests welcome.